So I'm still in the process of unpacking in our new apartment but hope to have a couple of blog posts up for you this weekend. In the meantime, I thought I'd introduce you to Myshka, my old pudgy cat since she may show up in photos on the blog from time to time! Furthermore, my own email account name, bellyopudge, comes from this little cat above. Her nickname over the years has been my "sweet little belly o' pudge". My mom and I rescued Myshka and her sister Mango 13 years ago from a stray cat who had a litter near a friend's house. Myshka has lived with me in the past, but I had to leave her in Vancouver 3 yrs ago when we moved to Wisconsin, due to difficulties involved in moving her around. But now that I'm back in Canada, Myshka is living with the hubs and I again. 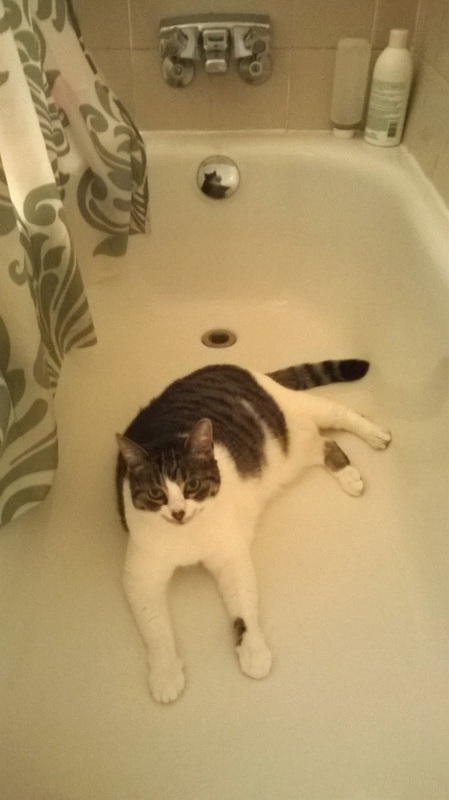 Here you can see that Myshka has found a refuge in the bathtub from the heat on very hot day. Due to her excessive love of food (like human like cat?) Myshka is now going on a diet,and will get regular exercise chasing fake mice and scrap bits of fabric around our apartment ;) She's at least 2 pounds overweight, and has arthritis, so losing some weight and strengthening her legs will make it easier for her to do the things she loves, like jumping on the bed to sleep next to us (I put a foot stool next to the bed for her but she doesn't like it). Myshka enjoys: sleeping on the bed, sleeping on chairs, sleeping on the floor, people scratching under her armpits, and a quiet patio where she can watch the neighbors from the safety of upper floor. Do you have a pudgy pet? How do you keep their weight under control?